I am not sure if observant Jews still today wear phylacteries, but I know they used to. They would walk around with sections of the Torah on their forehead. 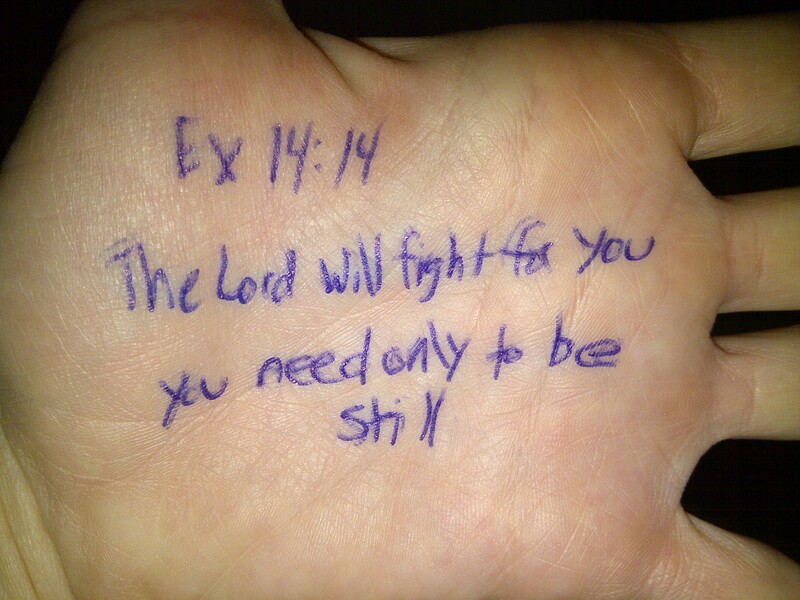 I don’t think we have to do this, but today a scripture impacted deep in heart heart that I wrote it on my hand so I could grab on to it whenever I needed throughout the day. I am not sure if it is because I am human. I am not sure if it’s because I am a woman. I am not sure if it’s because I was teased in school. I am not sure if it’s because I grew up in a broken home and knew I had bigger, older brothers out there somewhere, but didn’t really know them. I am not sure if it is because I was victimized several times in my life – I don’t wear the label victim, but I don’t minimize what happened either. I am not sure where it comes from, but I have always had this deep sense of wanting to be fought for. People fight for things of value and worth; land, jewels, titles etc. I am at a place where I know that I have value and worth simply because of who created me. I do fully accept this, but I still have this love to being fought for. When it doesn’t happen my heart aches. My heart is aching, and today my reading came to Exodus 14:14. Please understand it is a pet peeve of mine that people take scripture that was given for a specific people, at a specific time and hold it as a personal promise, but that’s exactly what I am doing today. I will be first to call myself hypocrite, let’s move on. God told Moses that He would fight for the Israelites and they just needed to be still. Being still is sooo not my forte but in this time right now, I think it’s exactly the thing He is telling me to do. So when my heart gets anxious I grab on to the fact that He will fight for me. How do I know this to be true? Because He already did – more than anyone else ever can or will. Thank you Jesus for the cross. You fought for me and won.